Template:Rating Creating and linking DLLs. This tutorial explains how to link / bind your own DLL to Unreal Engine 4 and how to use your DLL's methods for visual scripting in a Blueprint Function Library. This article originally centered on binding the DLL but here is also a brief explanation on how to build DLLs in different IDEs. In the New Project window on the left select Installed -> Templates -> Visual C++ -> Win32. Select Win32 Project in the middle. Name: the project CreateAndLinkDLLTut and the Solution name: CreateAndLinkDLLTutSol. In the next window Win32 Application Wizard - CreateAndLinkDLLTut click Next. On the left side of Visual Studio in the Solution Explorer make sure that CreateAndLinkDLLTut is selected. In the Add Class window select Installed -> Visual C++ -> C++ -> on the left side and C++ Class in the middle then click Add. In the Generic C++ Class Wizard window fill in CreateAndLinkDLLfile into the Class name: input field. Click Finish. On the left side in the Solution Explorer select the file CreateAndLinkDLLfile.h and copy & paste the following code. Replace all automatically generated code. Then select the file CreateAndLinkDLLfile.cpp and copy & paste the following code. Replace all automatically generated code. //Exported method that invertes a given boolean. //Exported method that iterates a given int value. //Exported method that calculates the are of a circle by a given radius. //Exported method that adds a parameter text to an additional text and returns them combined. //Exported method that adds a vector4 to a given vector4 and returns the sum. Save with menu bar -> File -> Save All. Build the DLL with menu bar -> Build -> Build CreateAndLinkDLLTut. The Output at the bottom should show a message like ========== Build: 1 succeeded, 0 failed, 0 up-to-date, 0 skipped ==========. 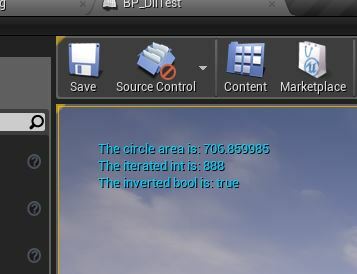 On Unreal Engine, create a new project: New Project -> C++ -> Basic Code. Name the project CreateAndLinkDLLProj and create it. Go to the main folder of your created UE4 project. Add a folder called Plugins. In the Plugins folder create an other folder called MyTutorialDLLs. Copy and paste the DLL CreateAndLinkDLLTut.dll you have created earlier into the folder MyTutorialDLLs. Add a new C++ class to your project in Unreal Editor. Choose the Blueprint Function Library as the base class. Name your blueprint function library CreateAndLinkDLLTutBFL. If Visual Studio does not open it automatically, open it by double clicking CreateAndLinkDLLTutBFL in the UE4 content browser. Open the CreateAndLinkDLLTutBFL.h and CreateAndLinkDLLTutBFL.cpp files. typedef bool(*_getInvertedBool)(bool boolState); // Declare a method to store the DLL method getInvertedBool. typedef int(*_getIntPlusPlus)(int lastInt); // Declare a method to store the DLL method getIntPlusPlus. typedef float(*_getCircleArea)(float radius); // Declare a method to store the DLL method getCircleArea. typedef char*(*_getCharArray)(char* parameterText); // Declare a method to store the DLL method getCharArray. typedef float*(*_getVector4)(float x, float y, float z, float w); // Declare a method to store the DLL method getVector4. // Method to import a DLL. v_dllHandle = FPlatformProcess::GetDllHandle(*filePath); // Retrieve the DLL. return false;	// Return an error. // Imports the method getInvertedBool from the DLL. FString procName = "getInvertedBool";	// Needs to be the exact name of the DLL method. // Imports the method getIntPlusPlus from the DLL. FString procName = "getIntPlusPlus";	// Needs to be the exact name of the DLL method. // Imports the method getCircleArea from the DLL. FString procName = "getCircleArea";	// Needs to be the exact name of the DLL method. // Imports the method getCharArray from the DLL. FString procName = "getCharArray";	// Needs to be the exact name of the DLL method. // Imports the method getVector4 from the DLL. FString procName = "getVector4";	// Needs to be the exact name of the DLL method. // Calls the method getInvertedBoolFromDll that was imported from the DLL. bool out = bool(m_getInvertedBoolFromDll(boolState)); // Call the DLL method with arguments corresponding to the exact signature and return type of the method. return boolState;	// Return an error. // Calls the method m_getIntPlusPlusFromDll that was imported from the DLL. int out = int(m_getIntPlusPlusFromDll(lastInt)); // Call the DLL method with arguments corresponding to the exact signature and return type of the method. return -32202;	// Return an error. // Calls the method m_getCircleAreaFromDll that was imported from the DLL. float out = float(m_getCircleAreaFromDll(radius)); // Call the DLL method with arguments corresponding to the exact signature and return type of the method. return -32202.0F;	// Return an error. // Calls the method m_getCharArrayFromDLL that was imported from the DLL. return "Error: Method getCharArray was probabey not imported yet! ";	// Return an error. // Calls the method m_getVector4FromDll that was imported from the DLL. return FVector4( -32202.0F, -32202.0F, -32202.0F, -32202.0F );	// Return an error. // If you love something  set it free. First hit the Compile button of the Unreal Editor to compile the code you've added and saved in Visual Studio before. Select the Event Graph and add the following nodes construct ( Click it and click it again to download it! ). Important note: If you don't see the functions in the dropdown, try compiling from Visual Studio and then reopening UE4. If this doesn't work, close UE4, remove Binaries folder and Intermediate folder (but avoid deleting Intermediate/Project Files). You will be prompted to rebuild the project. Then compile and save the blueprint and drag & drop it into the level. You can use any DLL from C code or C++ or other languages. You can use unmanaged or managed (CLR, .Net Framework) code from a project in your solution or external. Most issues arise from differences in the signature of the DLL function and the type definition in the Unreal Project. Automatic packaging of third party DLL is not yet supported, you will need to package the DLL, the DLL folder and the plugin folder as well, which is not created in a package by default at this time. Be mindful of load times of DLL, it may slow down your project. Be mindful of processing time of your DLL, your project loses execution control inside the DLL, until it returns, it may be expensive to perform some operations. C++ with proper class, namespace and name mangling. DLL with multithreading and callback example.